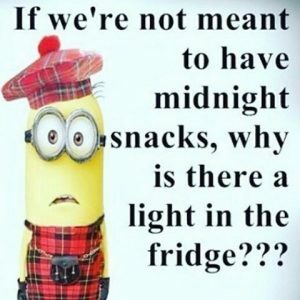 On my first born I remember there came a time where midnight snacking was a thing for my toddler. Imagine my horror, just when I have got out of the “baby stage” of wakening every few hours and started to get a good nights sleep, suddenly I am awoken by my almost two year old calling “Mommy, Mommy”. I roll out of bed trying to pry my eyes open so as not to bump into anything and I open my daughter’s bedroom door. There she is, standing in her crib saying “cheerios, hungry”. My response is “Do you want a drink?”, to which she replies “No, cheerios”. Well who has the heart to put a hungry child back to bed without feeding them?! So, I take her out of her crib, carry her downstairs, turn on the dining room light on the lowest dimmed setting, pop her into her chair and go to the cupboard to get a bowl of cheerios at midnight! I sit beside her and watch as she stares out the window into the dark night and whispers “quiet, everyone’s asleep. Daddy’s asleep” And your heart just melts looking at her innocent tired face staring out the window. I say to her “eat your cheerios”. To which she turns and picks up her spoon and begins to eat. “Bless her” I think to myself. She lowers the spoon after a few minutes and stares again out the window and repeats “quiet, everyone’s asleep. Daddy’s asleep”. “Yes sweetheart” I respond, “Lauren should be in bed too. Are you ready to go back to bed?” And she nods her head. A quick diaper change and she’s back snuggled in her bed after maybe 5 spoonfuls of cheerios!!! Night after night this happens for a week, and I begin to think “is this just becoming a habit, rather than actually fulfilling a hunger need?” As each night passes, the spoon barely touches her lips and her tired eyes almost close as she uses her little hand to support her head while she stares out the dining room window saying “quiet, everyone’s asleep. Daddy’s asleep”. So how do I stop this midnight snacking? Did I not feed her enough during the day or is this just a phase that all children go through? I am on my second child and he too has just gone through the exact same phase of midnight snacking. I don’t remember being as understanding on my first born as I am on my second though!